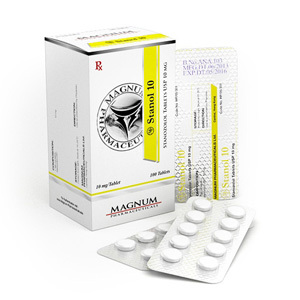 You can buy Magnum Stanol 10 mg directly in our online store! Stanol 10 is a steroid in which the minimum androgenic effect, but the anabolic activity is 320% higher than endogenous testosterone. This anabolic is quickly effective and besides, by taking it, you minimize the occurrence of adverse androgenic effects: greasy skin, rash. Stanol 10 mg tablets have a high bioavailability and stability (does not break down in the liver during the passage) due to the alkyl group in the alpha-17 position, but this makes stanozolol tablets toxic to the liver. However, the injectable form is also not without this drawback, the difference in toxicity and bioavailability of both forms of steroid is minimal. Winstrol is one of the safest steroids for women, as it has a low androgenic activity, although virilization and masculinization are still likely. Properly written course will help avoid side effects when taking Stanozolol. Excessive dosage of the drug can lead to myocardial hypertrophy.